Plugs and sockets that conform with the AS/NZS 3112 standard are used in Australia and New Zealand and several PacificIslands, which explains the name Australasian type. Comparable plugs are used in China, Argentina and Uruguay. Standard domestic 10A - 250V socket and plug. The power pins (N and A; A means Active = Live) and corresponding slots are obliquely positioned and resemble an inverted 'V'. The position of the pins makes Australasian type plugs irreversible. Even a not earthed, 2-pin plug is polarized. Standard domestic rewirable plugs always have 3 pins, but the earth pin may be omitted on plugs moulded on appliance cords using IEC type C1 or C7 connector, as used for low current double insulated devices - such as battery chargers or shavers. (image no. 5 on the page about power cords shows an example). The earth pin is longer than the angled power pins. From April 2005 partially insulated power pins are mandatory for all plugs. For safety reasons plugs sold in Australia and New Zealand often have a side entry cable. Brand names: PDL* (no. 1), and Elto, New Zealand (no. 2). Brand logos and deatail are given below. A horizontally mounted dual socket (no. 3) is the preferred model in Australian and New Zealand homes, but dual sockets with outlets on top of each other are available (no. 4). Brand name: Clipsal. The choice between a horizontal and vertical dual flush socket is quite unique. U.S. flat blade and European Schuko dual sockets are always 'vertical', whereas British BS 546 and 1363 dual sockets are 'horizontal'. 10A plug with threaded shroud (green arrow) and matching threaded socket (double arrow heads). This combination of plug and socket allows a securely locked attachment as illustrated in image nos. 6. Brand name: PDL. 7 Cord extension socket rated at 10A-250V. Brand name: PDL. 8 Standard 10A plug with clamp to facilitate removing the plug from a socket. The image shows both the plug and its three components. Brand name: HPM. 9, 10 Rewirable 10A plug with a single outlet, officially a "socket adapter plug", but commonly known as 'Piggyback' plug (no. 9). The rewireable form of this plug is now banned from sale in Australia, but it is still available for sale in New Zealand - where it is also known as a 'Tapon' plug. In Australia this plug/outlet combination is available only when moulded onto an approved extension lead (no. 10). Brand names: PDL, New Zealand (no. 9) and Arlec Australia Pty Ltd; made in China (no. 10). 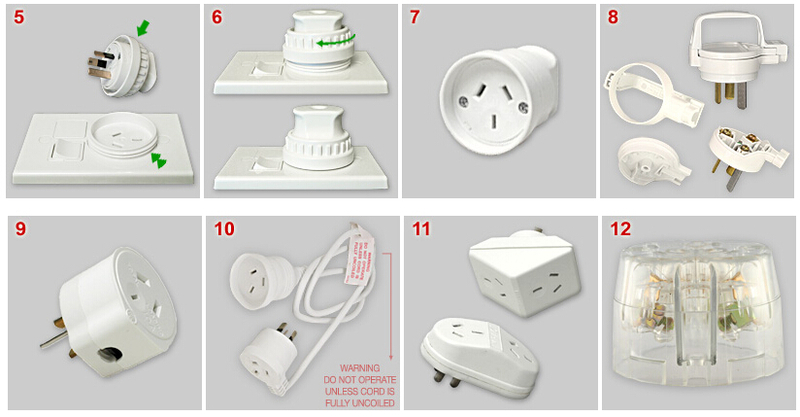 11 Two examples of 10A 2-way multi-plugs, in Australia referred to as double adaptors. Brand names: Ring-Grip, Australia (top model) and Resinart Ltd (renamed to D.R. Britton Ltd), New Zealand (bottom model). Side view of a standard 10A socket with transparent housing. These sockets are intended to be mounted in ceilings for the attachment, by use of a plug connection, of recessed ceiling lights and exhaust fans. Brand name: HPM.